VIP (Visions in putty) is a regular showcase project at the 1listsculpting miniature sculpting yahoo group. We pick a sculpting theme and participants get about three months to create a suitable sculpt. After that they can choose to have it cast in metal and they all get displayed at www.miniature-painting.net. For VIP 9 the theme was science fiction. We happened to be discussing making sculpts of members in the CMON forum and Avicenna mentioned wanting to be a space pirate. That gave me the idea of a Jack Sparrow type of space pirate which was great for VIP. And since Avicenna gave me the idea I said I'd try to give the mini his face. A quick note for novice sculptors. 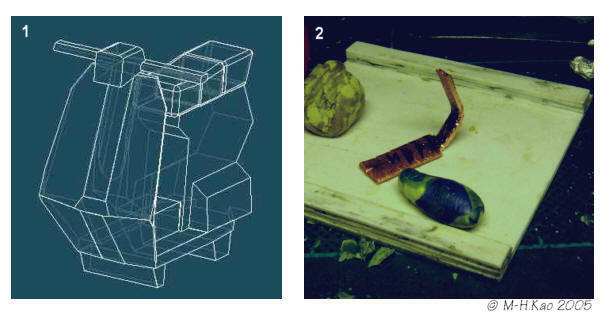 Every sculptor has his or her own tools, techniques and working methods. What you see here is just my way of doing things and it can differ from other sculptors. Don't let this worry you. Just try out different things and find out what works best for you. First thing you need is a clear idea of what you are going to make. Step one is to get some ideas and background info. I looked at pirates of the Caribbean again, checked internet and books for info on pirates and leafed through SF books. Made mental notes of what would be cool, etc. Next thing is to create a bit of background for the figure. 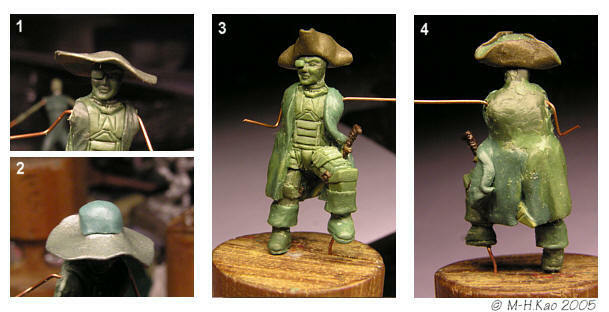 I find it easier to sculpt a figure when I've sort of created a character for it. Just like when you set up a role-playing or story character. With some brainstorming I had this image of a guy some time in the future who was so obsessed with the old romantic pirate stories that he decided to become one. As a matter of style and to fulfill his fantasy he has chosen to dress dress up like one, but not being a total fool he is using modern weapons and wears a power suit under his coat. I made a quick sketch of his clothing and added a few things referring to Avicenna and Tooshy. The main weapon would be a sniper rifle, the pirate was to have a scooter (or Doom) and there would be a molegrip somewhere. Last step is to decide on a pose. For this you can try out poses yourself, pose dummies or even use Poser or Daz studio. Since this figure was to be cast the pose had to be suitable for that. I went for the pirate leaning against the scooter with his gun pointed upwards. Pirate and scooter were sculpted at the same time but I'll discuss them separately. With mechanical sculpts like these I like to do some pre-designing in a 3D CAD program so I can play around with volumes to make everything looks right. This gave me the model on the right. I printed a technical drawing at the right scale and used this as a size reference while sculpting. I wanted an armature so I had something strong that I could mount the shield on. I cut a bit of brass sheet to size and bend it to follow the shape of scooter bottom and shield. 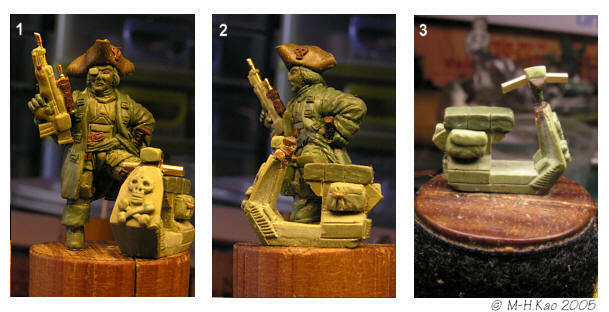 My preferred material for mechanical sculpts is a 50/50 mix of green stuff and Milliput. This mix holds together much better than pure Milliput and is a bit softer than green stuff. After curing it's hard enough to file, sand, etc. 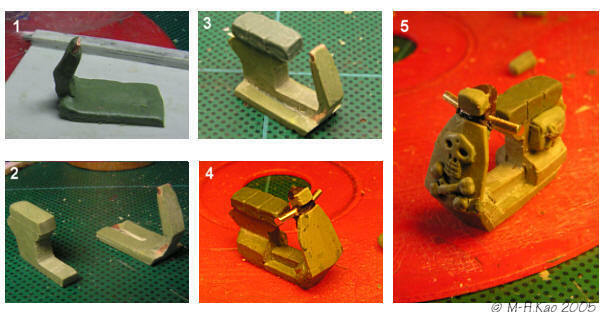 The armature was covered with putty mix. Left-over mix was flattened into a slab and all was left to cure. After curing the floor and support were filed into shape and the centerpiece was cut out of the slab with a jeweler's saw. They were glued together with green stuff which was also used for the saddle. The front shield was cut from cured sheets of putty mix and filed in shape. A brass rod was bend and glued on top of that with some brown stuff and a headlight (also cut from putty sheet) was glued on top. The motor housing was built using putty mix and filed in shape. Final details were sculpted in putty mix and the scooter was done. Oh, a molegrip was added to the sidebag. Again I started with an armature. This time a twisted wire one. I used 0.5mm copper but if you want to make one I'd recommend brass. It's more stiff. On my armatures I bend and twist legs, hip, spine and feet and add arms later. 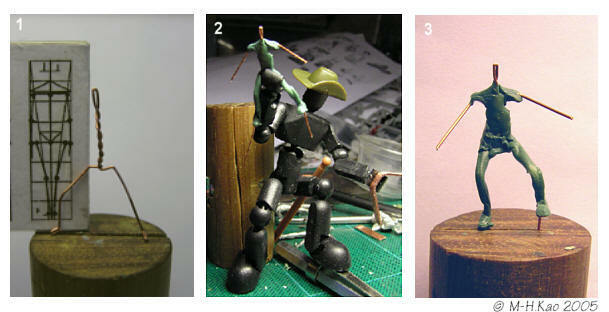 The armature is bent in the right pose using a posed plastic toy figure as reference and then fleshed out to freeze the pose. The arms are added at this stage by bending wire in a T shape and glueing it to the spine using green stuff. All this is left to cure. I used a putty oven (15Watt lightbulb in a tin) for this to speed up curing. 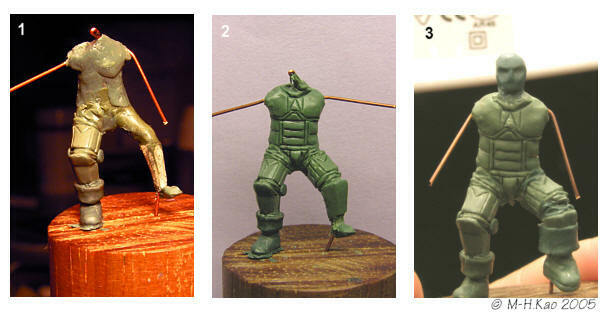 My sculpting order can differ from figure to figure but I tend to build it up from feet to head. 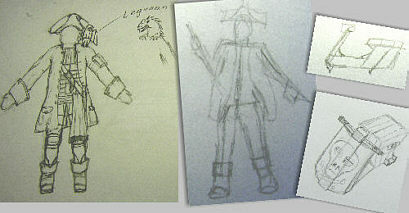 This gives the figure more stability and I find it easier to keep proportions. First thing I made was the space suit leg. I wanted to be able to scrape straight and sharp edges on it so I decided to use a mix of about 30% Milliput and 70% Green stuff. This still sculpts like green stuff but is easier to scrape and file. When the leg was done I made the boot in green stuff. Second leg was made but since I wasn't sure of the pose I decided not to do the knee yet. Torso was made as well and then work on the head started. With heads I usually do core, nose, eyes, cheeks, mouth, chin, details and then adjust where needed. Since I had said I'd use Avicenna's face for this one I used his photographs as a reference for face and nose shapes. Resemblance wasn't that good in the end since I needed a few modifications to exagerate the facial expression and wanted to add a (bionic) eyepatch. Oh well, I tried. I had done a testfit with the scooter and changed the pose by straightening the right leg and adjusting the left one. Bits and pieces were added and then it was time for the hat. I needed a round sheet of green stuff and flattened a ball of green stuff between two sheets of plastic (the plastic wrapper from the green stuff works well for this). I carefully put it on the pirates hat and pressed it down. I mostly used tools for this to avoid fingerprint. A core of green stuff was added, edges were smoothed and the sides were folded up like the real thing. Any damage or fingerprints were removed using clay shapers and it was left to cure. After curing I filled in all gaps to avoid undercuts and trapped air. 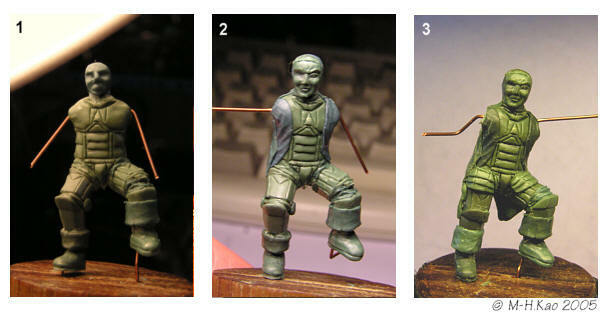 A sword was made from cured putty sheet (handle from brown stuff) and added to the figure. Then the rough shape of the coat was added in green stuff. A pose check with the scooter to check that the coat didn't block anything and then it was finished by adding drapery effect and smoothing the surface. Modifications to the gun were the addition of a longer barrel, folded bipod and a sniper sight. On the back hair details and coat details were made. Some final details were added like clasps on the jacket, skull on the hat and a sash which was also used to fill up some undercuts. 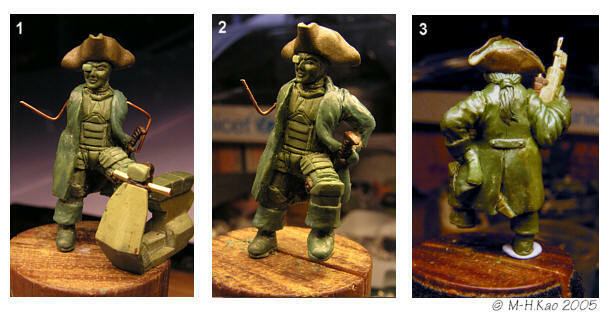 At this point the pirate was done and all I needed to do was to make it ready for casting. Since it would be using the scooter as support I decided not to make a tab or anything. So I filled the soles flat and added my signature in a hidden place. The handle bar of the scooter could be a casting problem so I decided to avoid that by making it a separate part attached to a sprue. All done and ready to conquer the dark seas between the stars. Or at least look cool while trying too. If you want to know more about sculpting, feel free to ask over here at CMON or hop over to the 1listsculpting yahoo list which is dedicated to miniature sculpting. Go forth, push putty and have fun. UOUUU very awesome. I'm new in this hobby and I'm learning a lot with this step by steps.